Happy New Year! 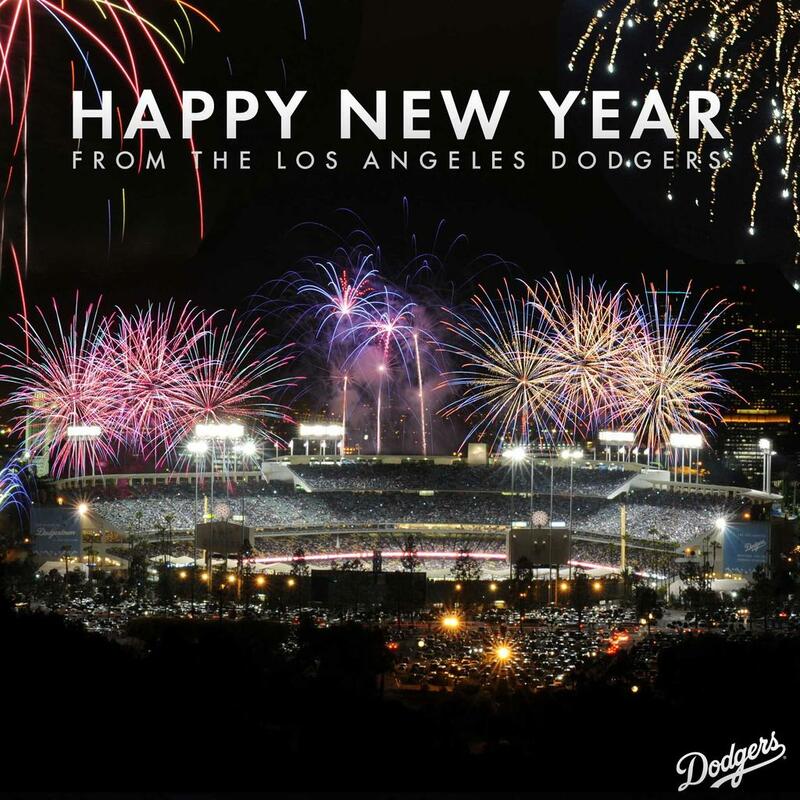 Pic via twitter @Dodgers. Emma at Dodger Blue World pays tribute to the Dodger players who passed away in 2012. The Kershaw's and some friends have just headed out to Zambia to check out Hope's Home - a children's orphanage sponsored by Kershaw's Challenge. Read it all here. 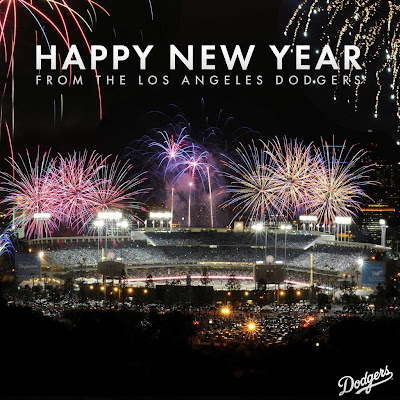 Steve Dilbeck at the LA Times put together a great list of Dodger New Year Resolutions. Check out From the Ravine's Extra Innings podcast as they discuss the potential lineups for both the Dodgers and Angels. 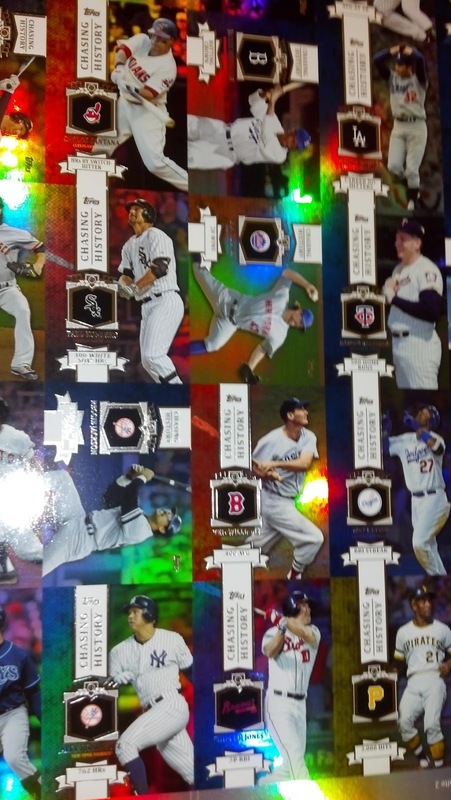 Topps recently unveiled a preview uncut sheet of Baseball cards on twitter that includes a sneak peak at some cards for Matt Kemp, Sandy Koufax and Jackie Robinson. See the pic below. I believe these cards are a part of an insert set for their upcoming flagship Baseball card set. An old friend report: Delwyn Young is drawing interest from MLB teams, via Chris Cotillo at CLNS Radio.com. He had double hernia surgery in June. Eric Stephen at True Blue LA is doing yeoman's work. He is writing individual biographies of every member of the 1988 Dodgers. He started off with Kirk Gibson yesterday, and Tim Belcher today. 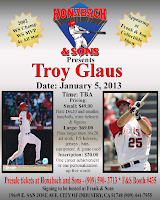 I wonder if he'll include former Dodgers GM Fred Claire in his biographies. I find his formation of that team to be one of the more interesting stories of that championship club. In this recent edition of putting the cart before the horse: Bae Joong-Hyun of the Korean Joongang Daily wonders if the Rookie of the Year award is possible for Ryu. I found it strange that this was the top post of 2012. I think it has something to do with the American flag that's posted up (thereby getting significant hits from google, as a result), or a short snippet from the movie Sandlot. This post was nothing more than gratuitous. It features an attractive lady who just happens to be wearing a Dodger cap while taking some batting practice. I find it funny that the top two post of the year have to do with patriotism and a scantily clad lady. This was a Spring Training signing event. If you know of anything planned for this Spring in Arizona please pass that information along. Here was another event listing - this time of the Stanley Cup. This was a very brief post that was more of an exultation after having to go through a 7 game losing streak in late June. 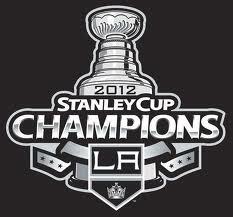 If there is one thing I'll remember most about 2012 it is the Stanley Cup Championship run by the Kings. Wow! Vin Scully proves once again that everything sounds sweeter when he explains it. Office hijinks at its best. Who wouldn't want to see our staff ace pitching some prep Baseball? There were also plenty of post that didn't reach the Top 10, but I thoroughly enjoyed writing. See some of those below. Sean Kane's artistic work ranks as one of the best I had seen all year. Any time I can stick it to the Giants, I will. As an avid collector, I had waited all year to write this. 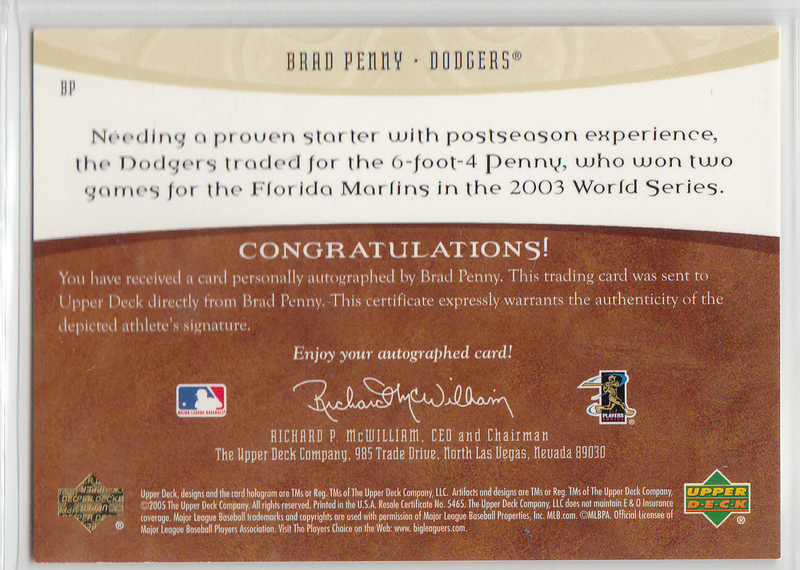 Check out my 10 favorite Dodgers cards of 2012. The 2012 Olympics was a special time for the Dodgers, and witnessing the love and support the team and husband, Matt Treanor, provided was awesome. Although this post was actually written in 2011, it easily outpaced any other post I wrote in 2012. It garnered over 50,000 hits - which is huge for this little blog. The reason for this is obvious. Misty May was a star performer in the Olympics in 2012, and well... this post can be deemed a little risque. Again, thank you for visiting this blog over the past year, and I hope you come back and visit in 2013. 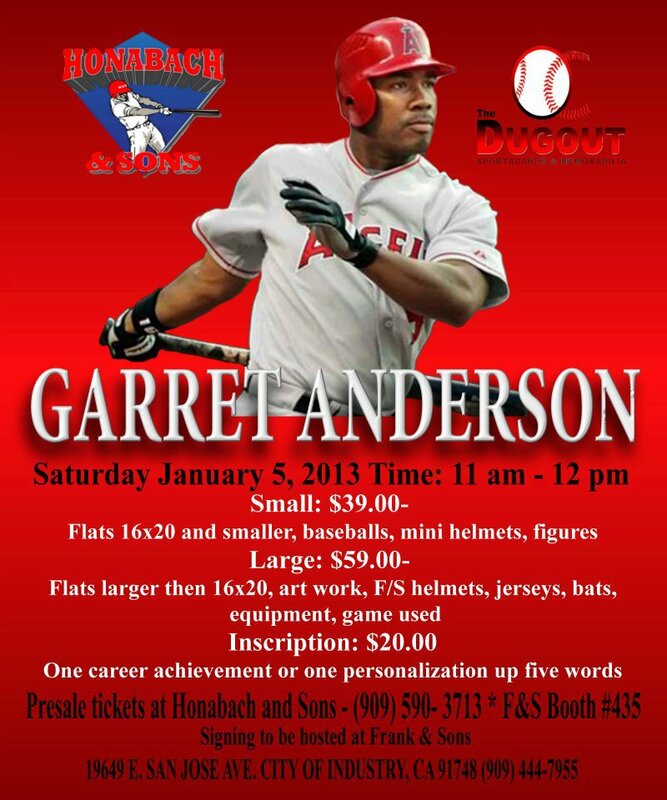 The 2013 year starts off with an autograph weekend at Frank & Son's featuring 3 Anaheim Angels on Saturday, January 5th. 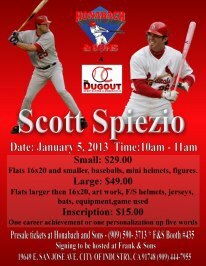 Scott Spezio (10:00 AM - 11:00 AM), Garret Anderson (11:00 AM - 12:00 PM), and Troy Glaus (12:00 PM - 1:00 PM) will be there. Go here for more information. BTW, I firmly believe a new CBA will be formulated within a month, but also believe they should just cancel this season. I'm burned out, which is sad considering that not one game has been played this season. On another note, the NHL owners erred greatly in believing the players association would just roll over and play dead, and I believe this process was necessary in order for them to understand that they are not masters of the league, but are instead partners with the players in the league. It took Baseball a long to realize that, but when they did league profits skyrocketed. Brad Penny had a couple of great seasons for the Dodgers in the mid-2000's. 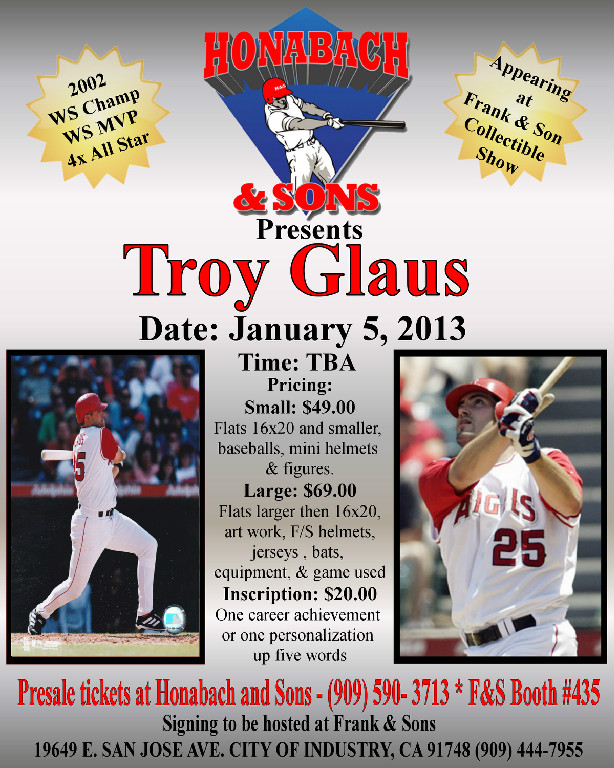 During the 2006 to 2007 seasons he won 32 games with a 3.65 ERA. He also was effective at keeping the ball in the park and represented the Dodgers in the All-Star game those seasons (the only times he's taken part in the mid-season classic). Since this time, Penny has had a rocky road. 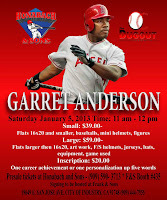 He has played for 6 different franchises; including a short stint in Japan with the Fukuoka SoftBank Hawks. Last year he came back to the Majors and pitched for the eventual World Series Champion Giants out of the bullpen, but was left off the playoff team roster. Currently, he remains unsigned for 2013. 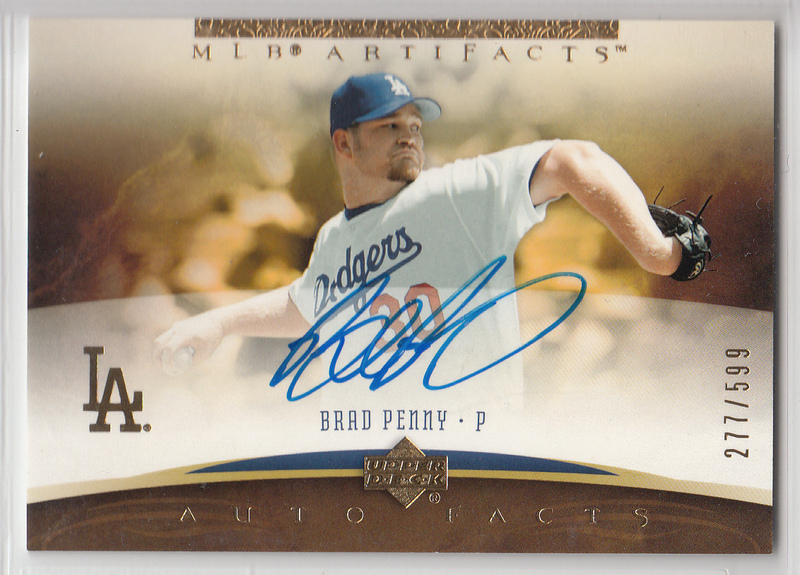 Featured here is a 2005 Upper deck Auto Facts card of Brad Penny. Below are his career stats, via Baseball Reference.